Phyl's Blog: Big birthday bash? Here's a photo of my parents' wedding, 51 years ago. 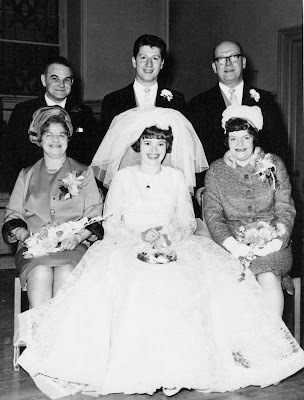 On the right of the picture is my dad's dad (William Buchanan) and my mum's mum (Jean Stirling). They would both have turned 100 years old this weekend, had they still been alive. That would have been quite a party! Maybe we should throw them one in their absence, or at least bake them a cake.